117 Hudson: One More Time! Just one more quick vote today, please. You don't mind, do you? You're already in a voting frame of mind. 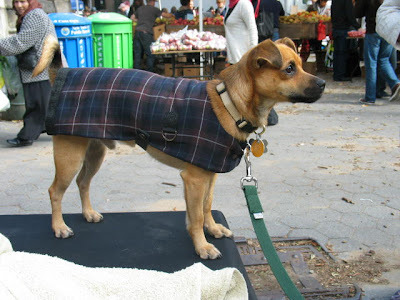 Look at the photo below and give me a yay or nay in the comments on the following question: Should I buy this coat for my dog? Ballot initiative info: He tried the coat on a few weeks ago at the artisan's market and the artisan took photos of him for her web site. It's a modified dachsund length coat with a custom strap for that perfect fit to avoid any sliding around. You'll also notice that the strap is relatively thin making it less likely to be soaked in...the stream, if you know what I'm saying. Though I was warned that the coat might not still be available if I were to decline to purchase right away (each coat is unique) I got an email a few days ago letting me know it's still ready to buy at any time should I so choose. The coat is $45. SOOOO liking it! It's much more dignified than the things my mom makes her dog wear. oy. I vote yes! He looks so dignified and gentry. I just want to make sure that you guys are all noting the price as well. I'm with you, I think it's cute as hell and well made and perfectly fit. But, as I'm fond of saying, is it $45 cute/useful? To me, the cost of the not as cute, wellmade, or perfectly fit matters... how much more expensive is this one? And how much cuter, wellmade, or perfectly fit is it? If he needs one, and you are only planning on buying one (at least at this point), I think it's a good buy. Custom fit, looks cute, he needs it, built to last? Sounds good to me! I feel like 'ya get what ya pay for' goes for our animals as well...so yeah. I'd say it's 45 $ worth of useful and cute! It's quite elegant. He looks very dapper. Go for it. Kizz, I'm with you...$45???? That's a whole lotta money. But then, I'm not sure what the average cost of a dog coat is, generally speaking. But you tried it on a long time ago and you're still thinking about it, so I'd say it's a keeper. I recently learned about valuing human clothing using the cost per wearing calculation. Given that he'd wear this for years potentially around 150 days per year the cost per wearing comes out pretty low. Does this count for dog clothing, too? I like the fit but not the pattern. I think it makes him look like a republican. Oh God, he's not a republican is he? Ask the lady to make another one. If he really needs a coat, $45 doesn't seem to bad to me. I actually told her I'd buy it a couple of hours ago. However I also just realized (while crafting his presidential platform) that he's a Republican. He barks and barks and barks until he gets what he wants and if that doesn't work he bites you*. *Slight exaggeration, it's more of a loving gnawing but it's still unacceptable behavior from an adult.